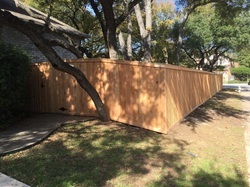 Privacy Fences are a great way to make your space in Boerne, TX yours and yours alone. Residential Backyards and Sideyards benefit from having Optimal Privacy Fences because of the security they provide. We offer a wide range of Fencing Choices for you to chose from - including Custom Fence Building. When you chose Boerne Deck Builders for your Privacy Fence, we will discuss with you all the options you have to chose from, including height, wood type, slat style, and stain. We also survey your land for slope and wind. Strong winds can damage Wooden Privacy Fences, knocking them down, and cracking in many cases. We build specially designed Fences to protect against Wind Damage! Once you approve the blueprints, we get to work! Our team is prompt and works efficiently. We can work around you schedule also, if needed. If you would like more information on having a Privacy Fence installed on your property, feel free to give us a call at (830) 428-2999! You can also reach us by sending in the form on the right of this page. We proudly offer No Obligation FREE Estimates for all projects. We look forward to hearing from you!